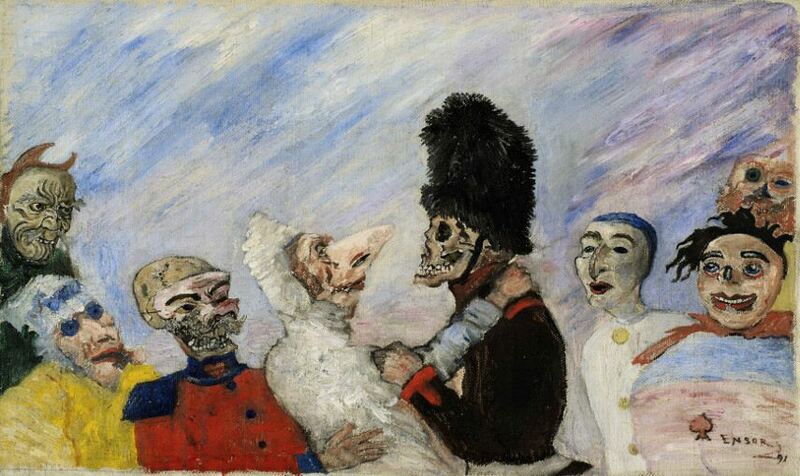 A vital figure in his local avant-garde scene and a valuable forerunner of 20th-century European Expressionism and Surrealism, James Ensor was a Belgian painter known for his grotesque and brightly colored depictions of masked skeletons, still lifes, allegorical scenes and carnivals. His surreal paintings explored autobiographical and social themes via a colorful style that featured some of the most subtly disturbing images his contemporary world has ever seen. Ensor’s satirical pieces tackled heavy subject matters such as death, religion, politics and similar crucial aspects of our existence. Stylistically, his paintings are characterized by harsh colors and thick layers of oil paint. It should also be noted that James Ensor was an extremely talented Realist painter as well – the majority of his early career was dedicated to realistic depictions much different than those from his mature life. James Sidney Edouard was born in the year of 1860 to parents James Frederic Ensor and Maria Catherina Haegheman. Although his father was quite an educated man, young Ensor had absolutely no interest in academic studies and left school at the age of fifteen in order to begin his artistic training with two local painters. Between the years of 1877 to 1880, he attended the Académie Royale des Beaux-Arts in Brussels where one of his fellow students was Fernand Khnopff. In 1881, James first exhibited his work to the public with modest success. 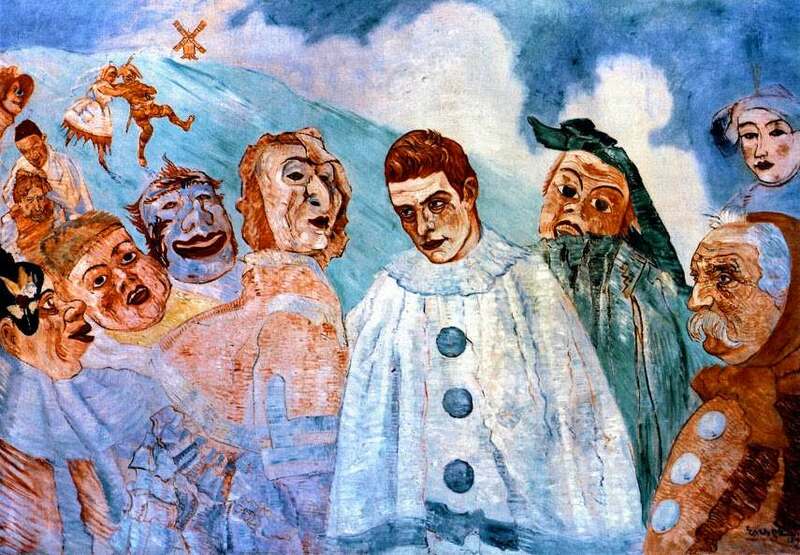 Never truly able to turn himself into a household name in the world of art, Ensor had his studio in the attic of his parents’ house until the year of 1917. Although he wanted to travel as much as possible, his journeys were quite sparse for the contemporary standards of rich young artists – by all accounts, Ensor had three brief trips to France and two to the Netherlands, as well as a four-day excursion to London in 1892. 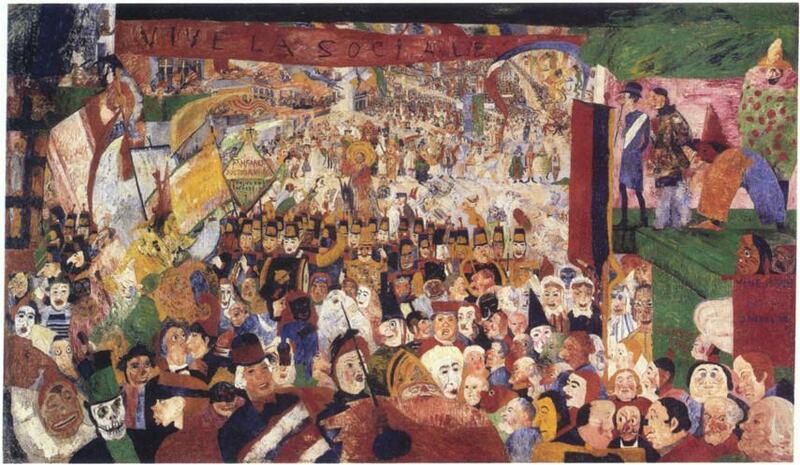 During the late 19th century, almost every painting Ensor authored was rejected as scandalous either for its theme or quality, particularly his painting Christ’s Entry Into Brussels created in 1889. However, there were exhibition shows that continued to be interested in his art and James gradually won acceptance and acclaim. Interestingly, even in the first decade of the 20th century when he was at the height of his continental recognition, his production of new works was diminishing and he increasingly concentrated on music. James might not have had any formal musical training, but he was a gifted improviser on the harmonium and spent much of his time performing for visitors that came to see his works. 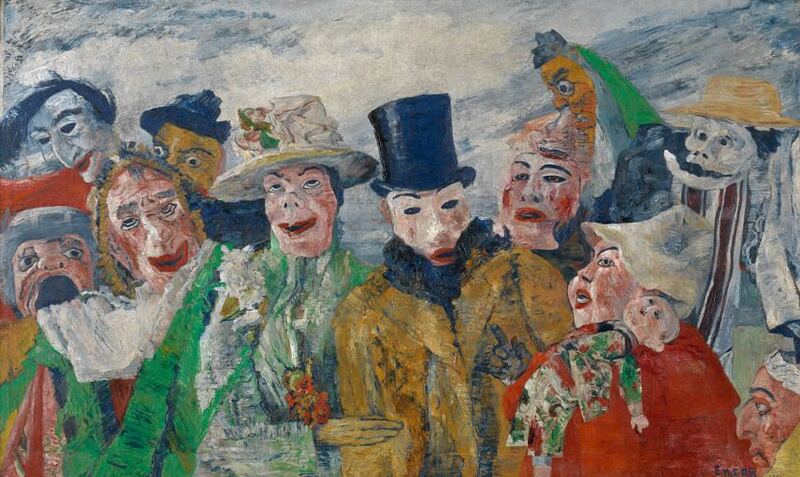 By the year of 1920, Ensor was a regular subject of major exhibitions across the Belgium. While his early works such as Russian Music (1881) and The Drunkards (1883) depicted realistic scenes in a somber style, his palette subsequently brightened and he favored increasingly bizarre subject matter. 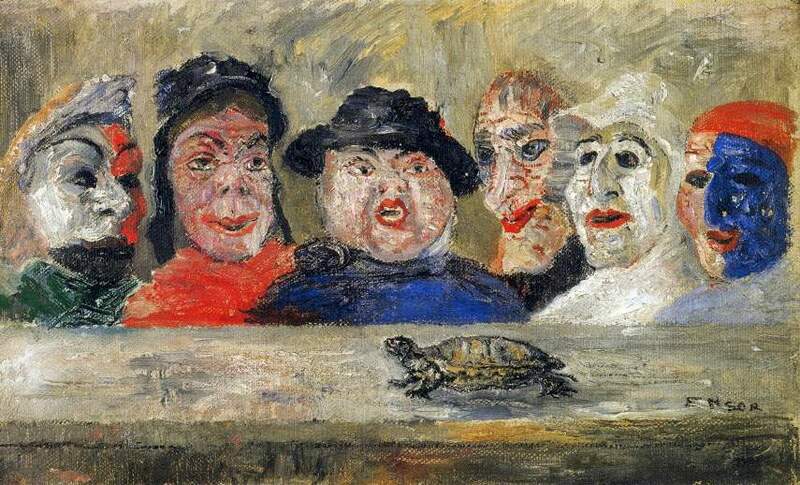 Many of his famous paintings featured grotesque masks inspired by the ones sold in his mother’s gift shop for Ostend’s annual Carnival. Such paintings as The Scandalized Masks (1883) and Skeletons Fighting over a Hanged Man (1891) started to symbolize what this artist wanted to show with his works – carnivals, masks, puppetry, skeletons and fantastic allegories that challenged many aspects of our societies. Constantly turning more towards music, the second phase of James’ career was deemed as much less productive. The aggressive sarcasm and scatology that once characterized his work was much less evident in his few new compositions. In fact, much of his mature output consisted of mild repetitions of earlier works. In 1929, Ensor was named a Baron by King Albert and was the subject of the Belgian composer Flor Alpert’s James Ensor Suite. Furthermore, he was awarded the band of the Légion d’honneur in 1933. Against the advice of friends, James Ensor remained in Ostend during WWII despite the quite realistic risk of bombardment. Fortunately, the artist was able to survive in Ostend without having to run to Antwerp or Brussels. In his old age, James was an honored figure among Belgians that saw him as a symbol of how art was changed from its conceptual roots at the start of the century. His daily walks made him a familiar sight in Ostend that embraced him as a local legend. Ensor died in this town after a short period of illness, passing away on the 19th of November in the year of 1949. Often deemed as too radical and extreme in both subject matter and method by his contemporaries, James Ensor was the master of using satire veiled in a colorful cloth that toyed with the viewers’ minds on many levels. And make no mistake – to be deemed as too extreme by the early 20th century avant-garde in Belgian was not a frequent occurrence. Unorthodoxly abandoning the usage of illusionism and one-point perspective to organize the pictorial composition, Ensor filled his paintings with disturbing content that seemed as if it was just about ready to escape the image and enter the viewer’s space. 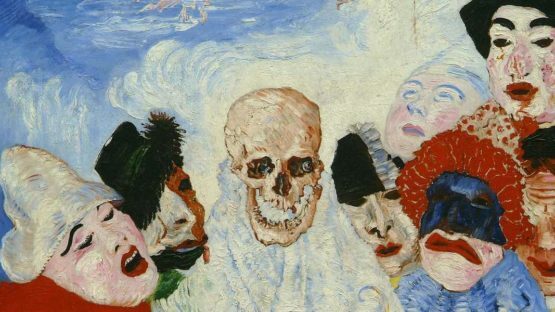 Ultimately, this artist’s subtle and furiously cynical social commentary was aimed at whatever Ensor wanted to criticize regardless of rules, social boundaries and consequences such a mocking could result in.